I so badly hoped this would arrive before Halloween, but it didn't so I'm reviewing it now. 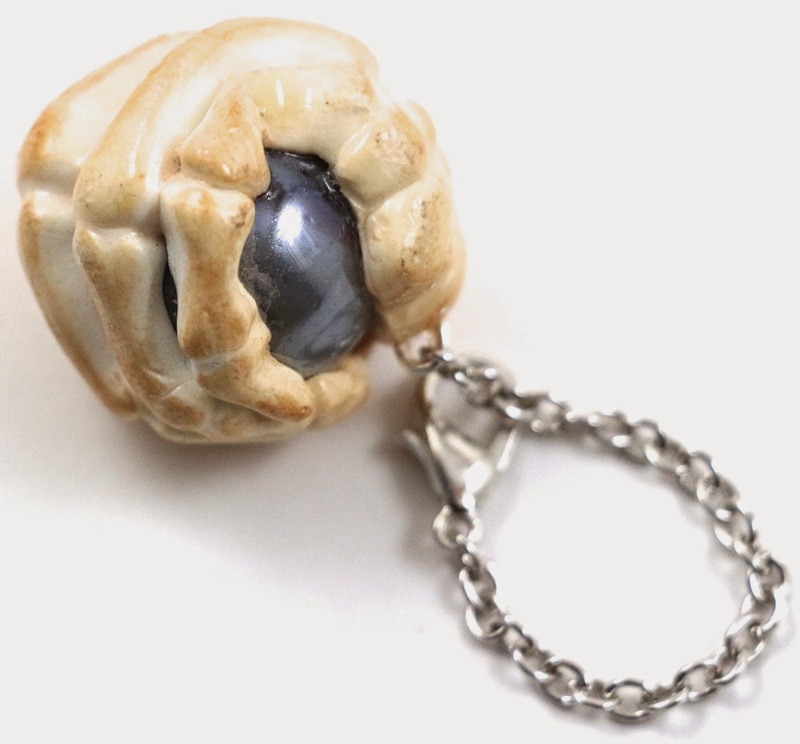 This is the special collection Notoriously Morbid released limited quantities of for their Halloween 2014 set. 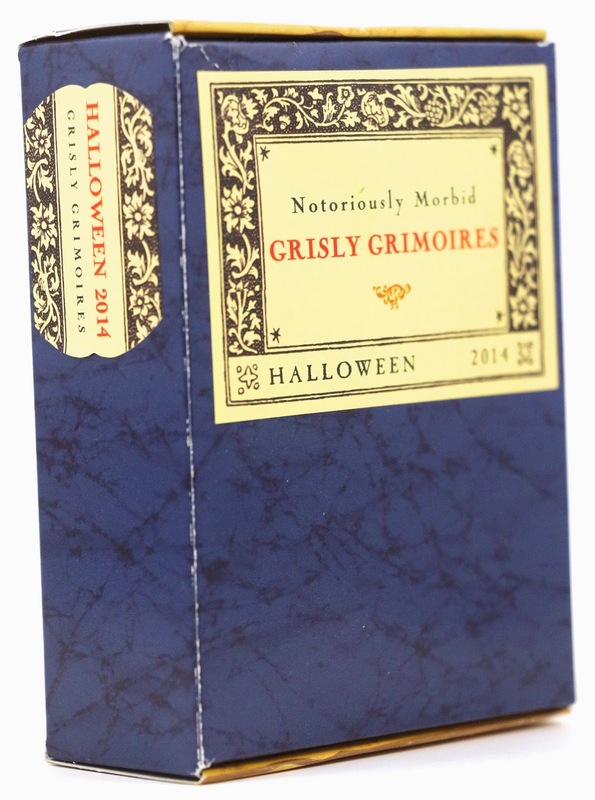 It's called the Grisly Grimoires, and the products came in a special little box. They only had a limited number available, and they were taking preorders for it, but I purchased it after it had released, and it didn't quite make it in time for Halloween. 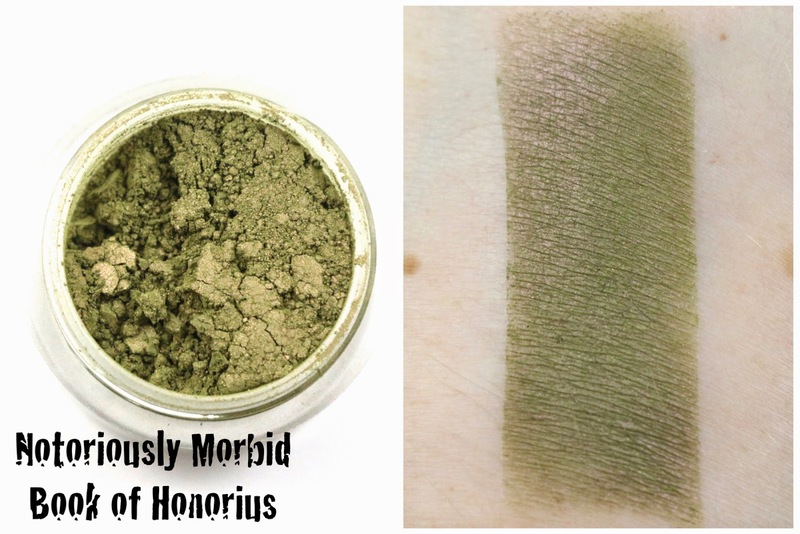 Notoriously Morbid is an indie cosmetics company owned by Carrie, and they specialize in fandom collections, with eyeshadows, lip products and lip balms, blushes, and they also have a subscription called the Vanishing Cabinet, which I have reviewed before! The fandom inspired collections they currently have include, Supernatural, Twin Peaks, Buffy, Doctor Who, and various others. Shipping - Notoriously Morbid's turnaround time has been slowly increasing over the past couple months, so my shipping experience may not be the same as yours. When I ordered this set, they had a stated turnaround time of 14-21 business days, but I did ask if there was any way to get it sooner since it did contain an item meant for Halloween. It shipped 12 business days later and arrived in 2 days via USPS from West Virginia to California. I will mention that I received tracking for this order, but it didn't actually get picked up by USPS until 5 days later, and I count when it "shipped" by when it gets scanned by USPS. Here is the box it came in, it was a little flimsy, and didn't close properly, it was a little beat up, and had a tiny rip. Product Size - This was a limited set, and all shades were exclusive full sizes to the set. 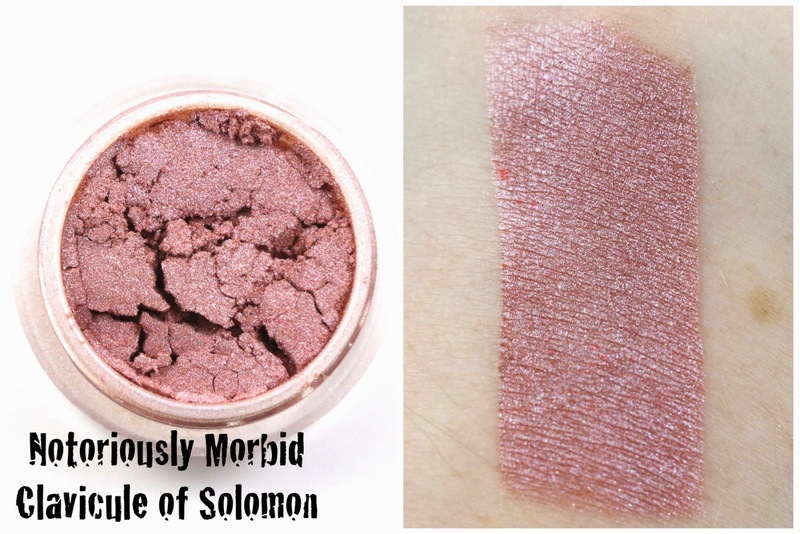 However, for all other shadows and one of the collection blushes, Notoriously Morbid does offer sample bags, mini jars, and full size jars. For the rest of the Divinations Blushes, they are only available in samples or full size jars. 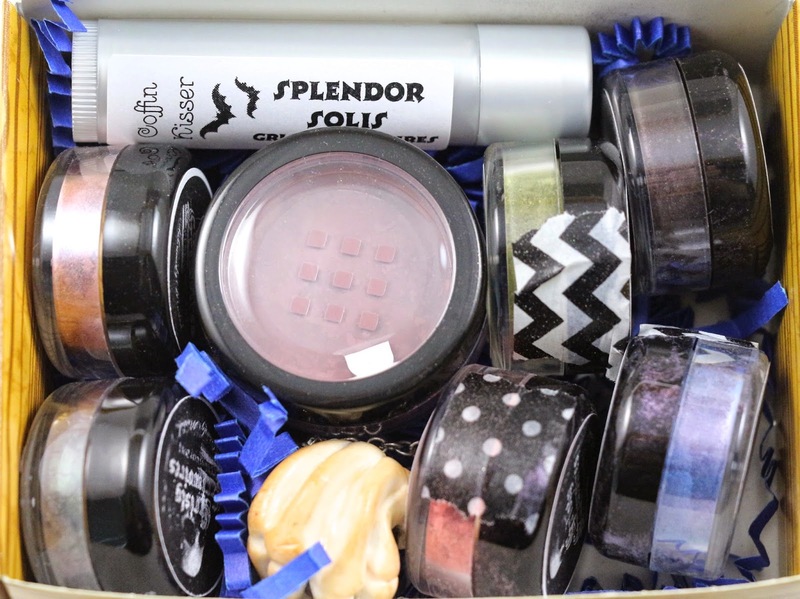 Free Samples - With this order, it came with one sneak peek sample of a Black Friday shade. Most of my other Notoriously Morbid orders come with 2 sample bags. All swatches are done over Too Faced Shadow Insurance primer unless otherwise noted. Here is how it looked packed in the special box. The Coffin Kisser did have shrink wrap, but it looked like the heat gun hadn't been put to it, it was pretty loose. And the shadows were all taped, but some still leaked, and you can see it on the jars, and it was on the lid as well. Hand of Fate charm - Just a little bonus keychain that came with all of these sets, I may put it on my keychain, I haven't decided yet. Book of Honorius - "A juniper green that pulls a strong red shift." 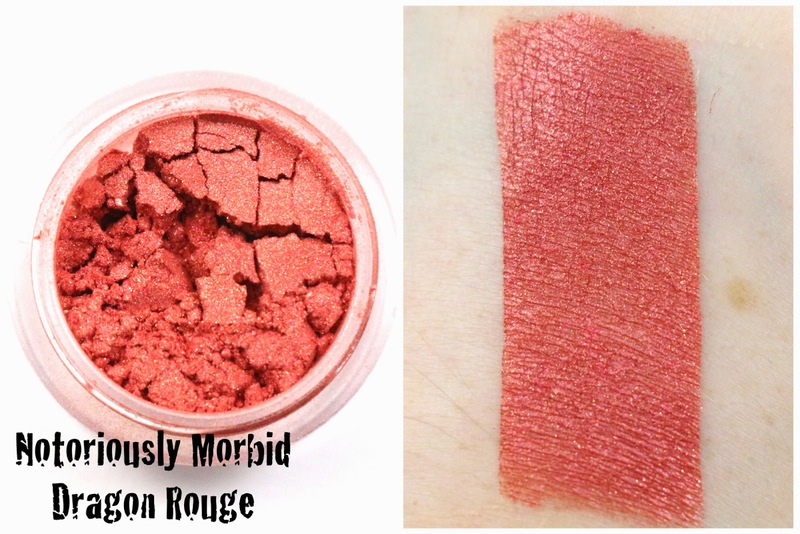 This shade is almost matte, with the exception of the red sheen, but I think it would look especially good paired with Book of Shadows, or Magus. 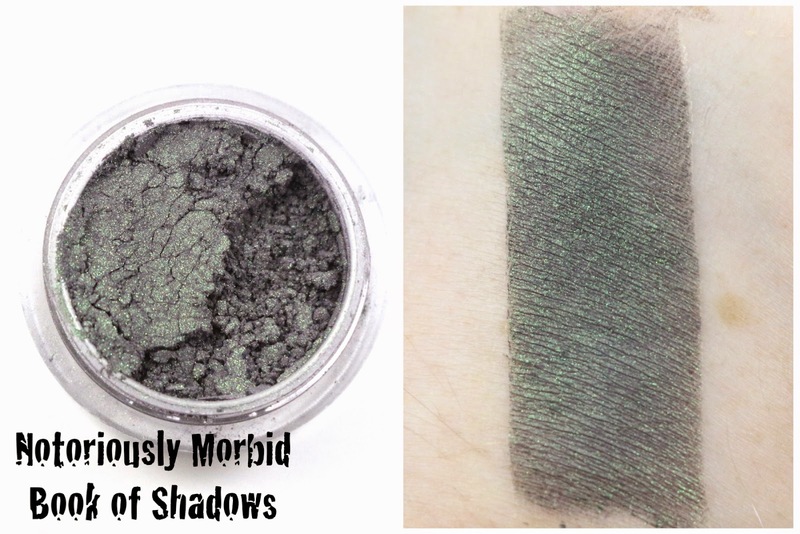 Book of Shadows - "A dusty eggplant with strong fern green duochrome shift." Oooh what a pretty shadow! The shift is really noticeable, and I love the eggplant colored base, I bet this would look awesome over some glitter glue, or Pixie Epoxy, or paired with Necronomicon. Clavicule of Solomon - "A perfect blush pink with subtle iris shift." The glitter/sheen was all over for this shade, but it's definitely a nice rosy pink color, with tons of sparkle. Dragon Rouge - "A vivid coral with gold and pink shimmer." Ok, an almost red eyeshadow, this is probably my favorite. It was so pigmented too, and opaque without much product. I am fairly sure I don't have a dark coral shade like this in my collection, I love it! 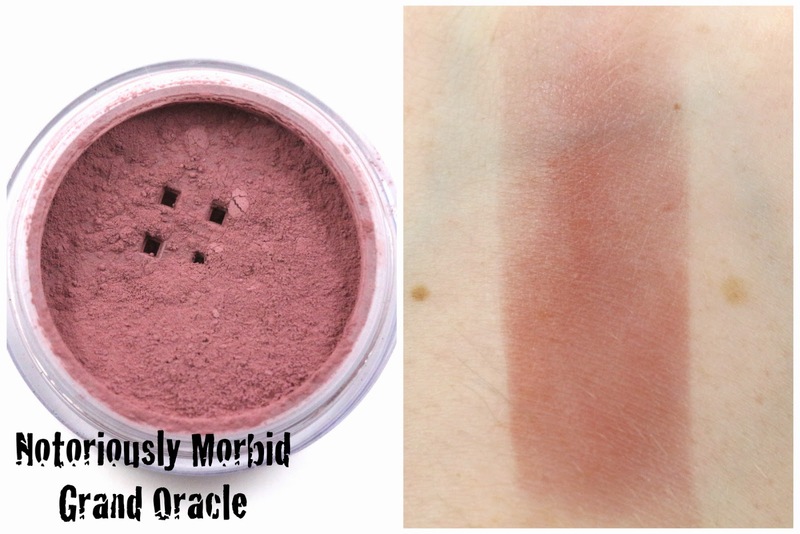 Grand Oracle blush - "A muted plum/mauve in a matte finish." Swatch is done over bare skin, and blended out. What a perfect blush for fall/winter, I love dark blushes for this time of year, and especially mattes! This will be great to wear with some of the shadows from this collection. Magus - "A blue/orchid purple packed with blue and amethyst sparkle and a dusty red shift." The red shift is pretty noticeable on this shade, it almost looks violet over the blue base, but it's a pretty shade. 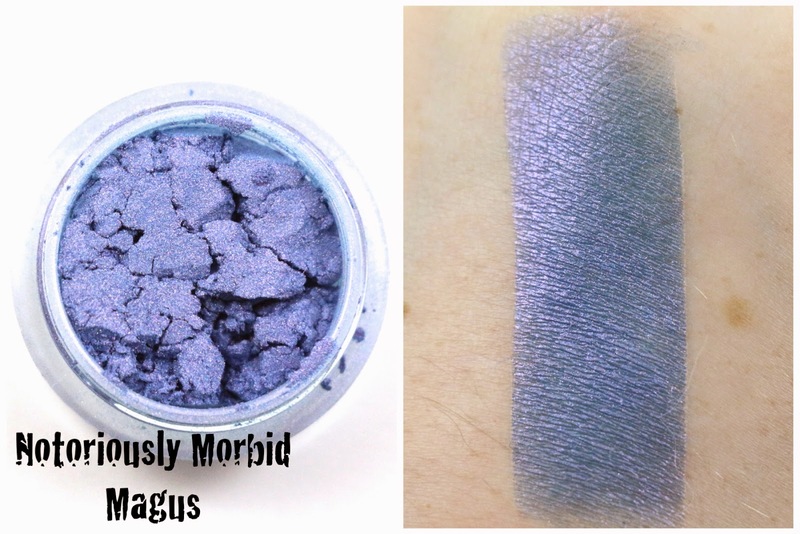 Not super unique to my collection, but Notoriously Morbid shadows are super buttery, so it will definitely be a better quality one. Necronomicon - "A raven black with purple shift and honey sparks." It's a very pretty shade and the purple is fairly prominent, but sometimes it can be hard to see the shift or sparkles in black base shades when they are blended out. Especially since, black is usually not a shade you are packing on to your eyelids when doing your makeup, but this might look good in the crease with Clavicule of Solomon. Splendor Solis Coffin Kisser - "Sweet brandied apricot"
This is basically like a sweeter almost peachy flavor, but with a darker element to it. I love the Coffin Kisser lip balm formula, though this is not my favorite flavor I own. 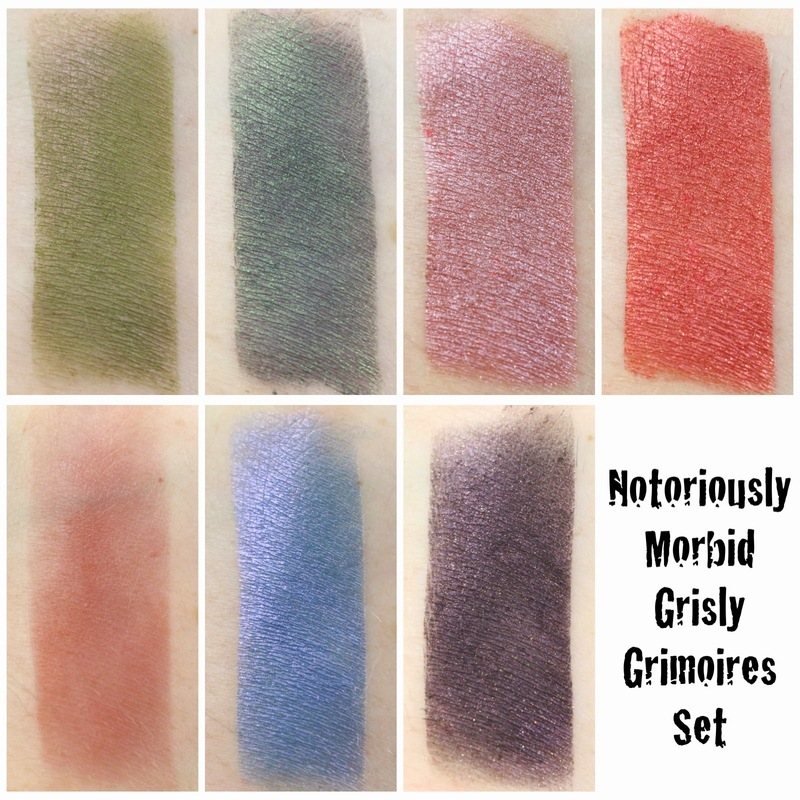 Overall, I thought there was a lot of variety in the Grisly Grimoires set, and a really good value; the set was sold for $25, and with the eyeshadows alone it was worth $33, then if you add in the Coffin Kisser and blush it's $42 total. I especially loved the Book of Shadows and Dragon Rouge shadows. Plus, the blush is very season appropriate. And I always appreciate a good lip balm. The set had a good value, and even though the box itself was a little flimsy, the products inside were top quality. Customer Service - For this order, I contacted Carrie and asked if there was any chance I would get it by Halloween since I did not preorder it. She said she would do her best. It hadn't shipped by Halloween week, and I knew it would never make it, so I emailed again, and she said she would see if she could get it out that day. I did not receive tracking on it until October 30th, and it didn't get picked up by the post office until 5 days later. When it arrived, my invoice had a very nice note stating she was delayed more than anticipated due to running out of the lip balm tubes. I wish she just would have mentioned that, I wouldn't have minded waiting longer on the lip balms, but that's ok. She also included a $10 off my next order code for me as an apology for it not making it by Halloween. At first I was a little ticked off that it didn't get sent when she said it would, but the fact that Carrie tried to make it right when it arrived was very nice of her, and I appreciated the gesture. Availability - This set was sold in limited quantities for Halloween 2014 only, and is no longer available. The shades were exclusive to the set, and as far as I know, will not return. Overall Satisfaction - I thought this set had a good value, variety, and good products inside. My favorite shades were Book of Shadows and Dragon Rouge. I will of course be ordering from Notoriously Morbid again, as the customer service was attentive and resolved the issue I had. What did you think of the Notoriously Morbid Grisly Grimoires set? Let me know in the comments!